Domain name registrar GoDaddy Inc. (NYSE: GDDY), which bills itself as "the world's largest technology provider dedicated to small businesses," -- financial results release for the fourth quarter and fiscal year 2015, Wednesday, February 17, 2016, after the stock market closes. Conference Call: dial (877) 201-0168 in the United States or (647) 788-4901 from international locations, with passcode 21399236. LIVE webcast of the call-- Listen to the Webcast via GoDaddy's investor relations website at https://investors.godaddy.net. Godaddy's (GDDY) CEO Blake Irving on Q4 2015 Results - Earnings Call Transcript | Seeking Alpha: "... just yesterday I noticed another timely proof point that reinforces the incredible importance of owning one's personal identity and presence online. I would encourage you all to check out what's presented when you type jebbush.com into your browser. Whether you are a presidential candidate, a small business or even a sellside analyst, I think we can all agree that with the increasing importance that the Internet plays on our daily lives, claiming and owning your digital identity just continues to become more and more important ..."
UPDATE from GoDaddy press release: GoDaddy (NYSE:GDDY): Q4 Revenue of $425.4M (+14.4% Y/Y) beats by $1.93M. Net LOSS for all of 2015: (120.4); 2014 Net Loss was (143.3). Revenue of $425.4 million, up 14.4% year over year, or approximately 16.7% on a constant currency basis. Total Bookings of $464.0 million, up 13.3% year over year, or approximately 16.7% on a constant currency basis. Adjusted EBITDA of $73.5 million, up 30.3% year over year. Unlevered free cash flow of $52.3 million, up 146.7% year over year. Customers were 13.8 million at December 31, 2015, up 8.7% year over year. Annual ARPU of $121, up 6.3% year over year. Domains revenue of $218.1 million, up 9.5% year over year. Hosting and Presence revenue of $155.5 million, up 12.7% year over year. Business Applications revenue of $51.8 million, up 50.1% year over year. International revenue of $110.6 million, up 16.9% year over year, or approximately 25.3% on a constant currency basis. GoDaddy launched localized websites, product offerings and customer care across Asia in January. GoDaddy now operates in 10 languages and 14 markets in Asia and 26 languages and 53 markets globally. 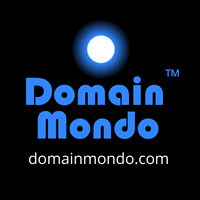 GoDaddy now has 62 million domains under management, representing over 20% of the global total. At December 31, 2015, total cash and cash equivalents and short-term investments were $352.5 million, total long-term debt outstanding, including current portion, was $1,044.0 million, gross debt was $1,083.5 million and net debt was $731.0 million. For the first quarter ending March 31, 2016, the Company expects revenues in the range of $428 - $432 million and adjusted EBITDA in the range of $111 - $114 million. For the full year ending December 31, 2016, the Company expects revenues in the range of $1,820 - $1,845 million and adjusted EBITDA in the range of $400 - $410 million. 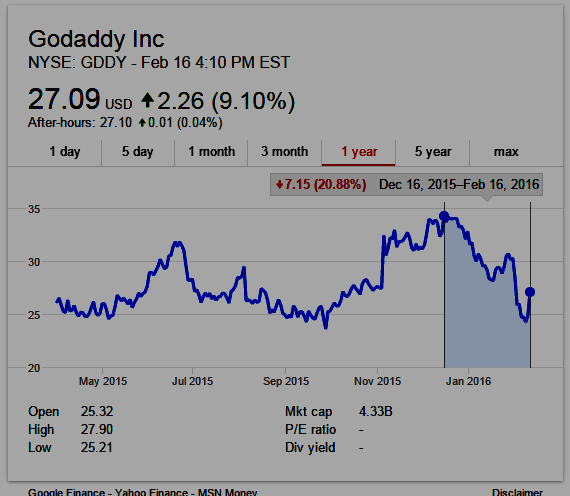 GoDaddy - Wikipedia: "In June 2014, GoDaddy once again filed a 100 million dollar IPO with the [Securities and Exchange Commission (SEC)] ... The filing gave an inside look into GoDaddy's finances and showed that the company has not made a profit since 2009 and since 2012 has experienced a total loss of $531 million."